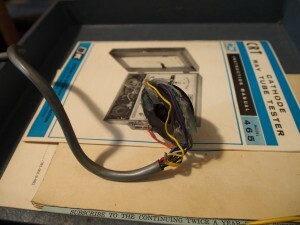 I’m continuing to work on repairing my antique television, which I began documenting here. 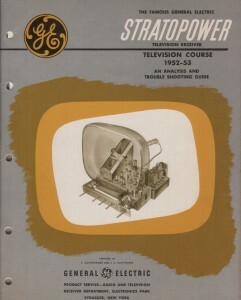 There are a few good resources for television repair, such as Notes on the Troubleshooting and Repair of Television Sets. The wonderful thing about televisions is that they’re basically big oscilloscopes, so you can frequently use what’s on the screen as a detailed troubleshooting resource. 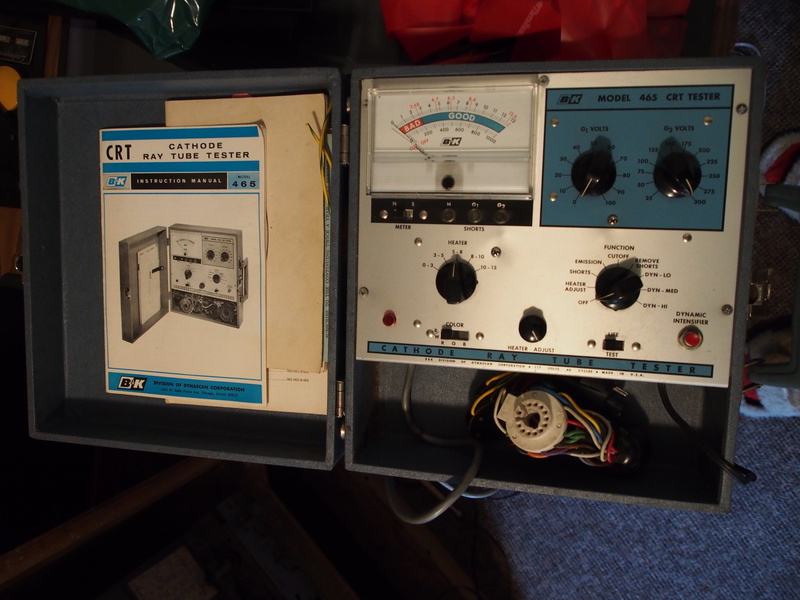 However, there are a number of risks, too: the CRT anode gets 16KV, which is enough voltage to require your daughter to attend expensive therapy when she’s old enough to understand What Happened To Dad. With everything guaranteed antique and without good documentation or test equipment, it’s also hard to know where to start. And certain bits and pieces, if they’re broken, will be very difficult to replace on the cheap — for example, the CRT. Most resources suggest starting by re-capping the thing entirely, i.e. replacing all the capacitors, which is a lot of work and some expense. I wanted to ensure that it was worth putting the time in. So I bought the repair manual on ebay. 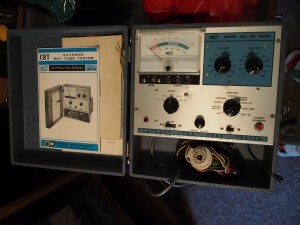 These manuals are gold — they’re beautifully made, often with the engineer’s pride evident in the description of the various circuits. 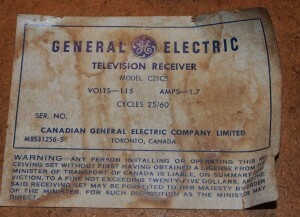 But more than that, they are evidence that the TV was designed to last and made to be repaired. And there’s even a charming “errata” page tucked into it. 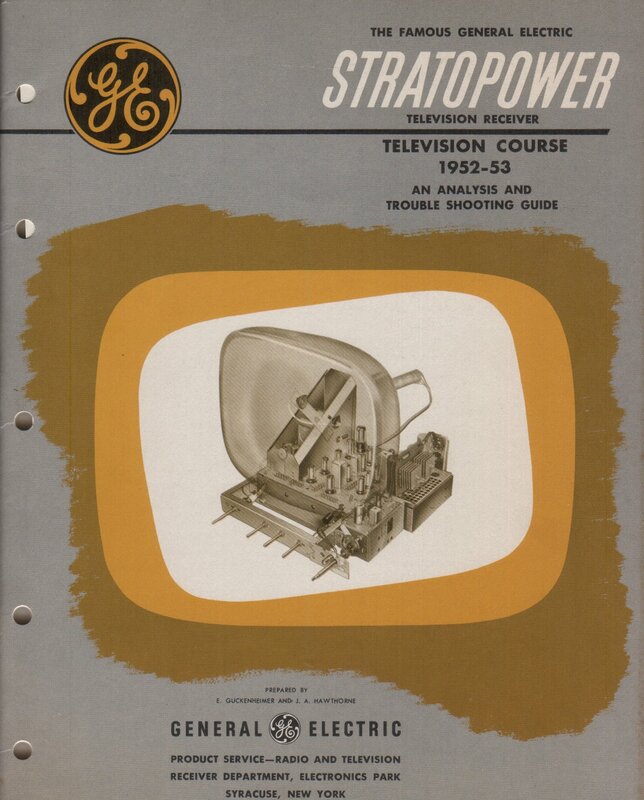 I hope someone else finds this manual useful in fixing their own Stratopower-based TV — if you do, leave a comment. So before I did any real troubleshooting, beyond the two tube replacements mentioned earlier, I managed to get the TV fired up with an RF modulator attached to an NTSC video source (a Raspberry Pi playing a video). Nothing was displayed on the screen at all, but I could hear the audio, meaning the tuner and at least some of the amplifier circuits were working OK. And I could hear the high frequency horizontal scan. That’s a big chunk of complicated circuitry eliminated from suspicion, at least for the moment. My attention turned to the high voltage supply (the aforementioned 16KV) and the CRT. 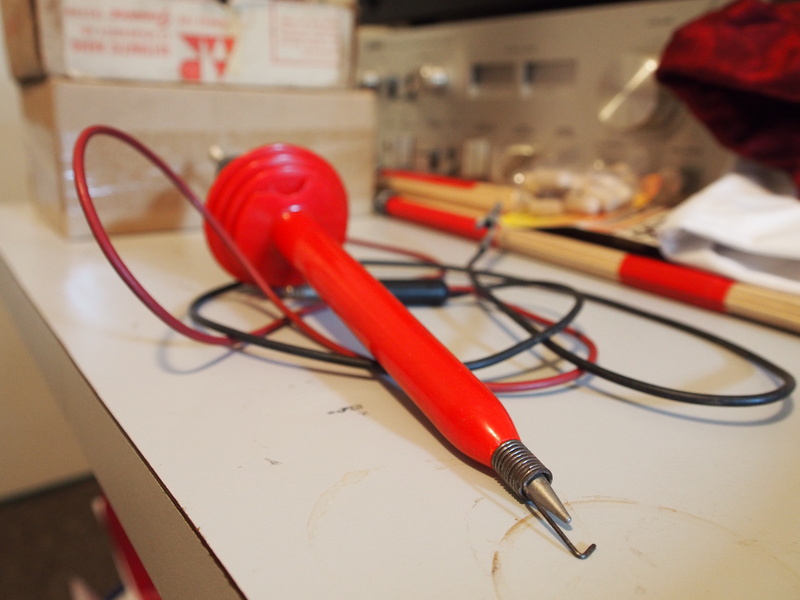 Dave at The Hackery lent me a high voltage test probe. (Thanks, Dave.) This reduces the dangerous 16KV to a voltage that a regular multimeter can read. This is basically a mondo resistor that is hopefully more attractive to the 16KV high voltage source than, say, the pathway between your fingertip and the floor. But it’s an antique with no identifying marks. I sniffed out this PDF of a manual from a Heathkit HV probe that *sure looks* identical. It claims a 100x voltage reduction, meaning 16KV would show up as roughly 160V. I attached it to the CRT and propped my voltmeter’s test leads against its terminals, bid a potential farewell to the fall air outside, and turned on the TV. It warmed up to about 120V, which is a ways below spec, but still should be enough to get the TV to display something. So far so good. This thing came out of the box smelling exactly like it should: dusty, with a slightly sour smell of what — Old dielectric? Early plastics? Flux? People always talk about the joys of musty bookstores, but I maintain that antique electronics smell just as good. Bad. Whatever. 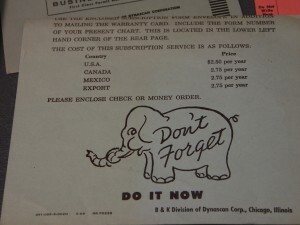 Again, the electronics ethic of past decades came to the rescue: the manual included a full wiring diagram so I could be sure to solder the dangling wire to the right pin of the tube socket. And, luckily, it worked! Hooking it up to the CRT and firing it up gave me an emissions reading that was firmly in the “Bad” range, with no short circuits reported. With a quick application of the “Dyn-Lo” rejuvenation setting — and a few attendant sparks in the neck of the CRT — the reading came back up to “Good”. Hooking it back up to the TV internals gave me a visible band of white, all the way across the screen, and perhaps 4 inches high. This faded after a minute and couldn’t immediately be convinced to return — but I’m optimistic that I’m back in business. I’ll work on re-capping the unit next, now that I think it’s worthwhile. I’d like to request a license in order that I may be spared a fine and prevent Her Majesty from disposing of my television. 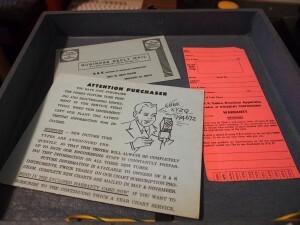 I can provide a picture of the label if necessary; it contains additional details such as the serial number. I haven’t received a response to my inquiry yet and I am concerned that I may be operating equipment illegally. Could you please let me know if a license is available? Still nothing. It was time to go RIGHT TO THE TOP. I am sorry to have to escalate this to the Prime Minister’s Office, but I have not yet received a response to either of my previous emails to Mrs. Raitt. Please see below for what I hope is a clear and specific inquiry. Guess what? It worked! I’d like to think that the Prime Minster himself came storming out of some clandestine meeting with Certain Members Of His Senate and took the time to upbraid the Minister of Transport for her lax attitude towards corresponding with the citizens of this great nation. Thank you for contacting our office and following up on your request dated August 14. We have passed your email along to the appropriate people and they will be getting back to you as soon as possible. Should you wish to contact someone directly at the Ministry of Transport the number is 1-866-995-9737. We apologize for the delay. The Office of The Honourable Lisa Raitt, P.C., M.P. 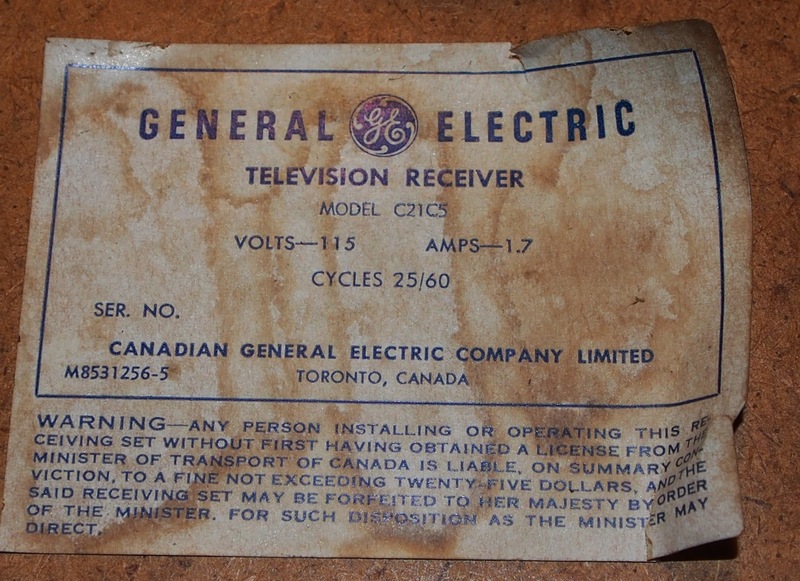 Thank you for your correspondence of September 5, 2013, regarding a warning label affixed to a General Electric television. I am pleased to inform you that the Radio Act, which contained a requirement for the label cited in your email, is no longer in force. This being the case, you are free to operate your television without fear of recrimination from the Government of Canada. Thank you for writing. I trust that you will enjoy your vintage television. c.c. Office of the Right Honourable Stephen Harper, P.C., M.P. 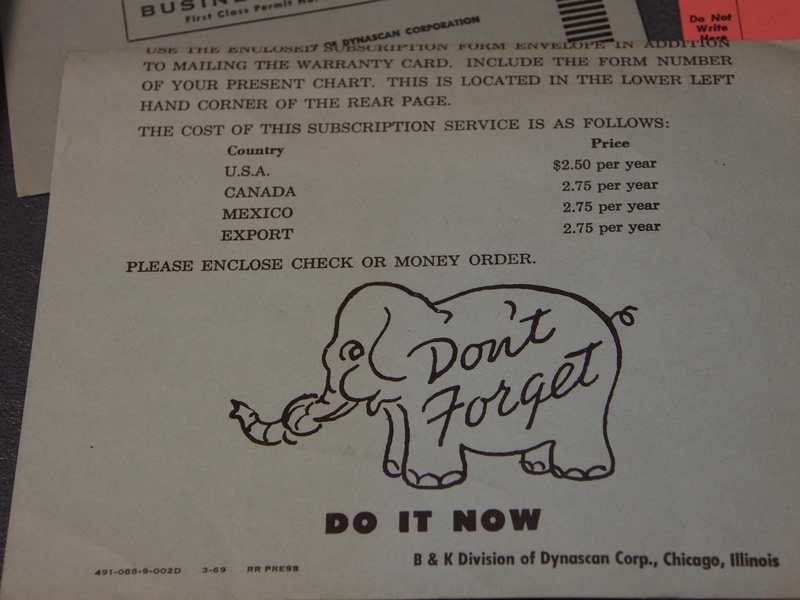 Incidentally, home receivers were exempted from the Radio Act’s licensing scheme in 1952 — the year my TV appears to have been made. And the warning itself makes reference to Her Majesty, who ascended to the throne on Feb 6, 1952. Interesting times for television manufacture in Canada! Many thanks for your reassurance. The television is “new to me”. Consider it my small voice of support for a large civil service that is well-versed in Canadian history. Wow, they actually took the time to send a useful reply! Most probably they searched your name on Google, found your previous post and thought it would make some great PR stunt. Either that or the Canadian government is just very friendly. I suspect this got tasked to a staffer and luck gave me one with a sense of humour. I wonder how much work they had to put into it. Sometimes I don’t feel like I get much for my tax dollars — witness Canada’s current senate spending scandal — so this was a nice little gift. What would have made great value for your tax dollars is if one of them dressed up as the Queen of England and turned up to confiscate your TV set. Halloween is coming soon, after all… If she does show up, I’ll check her business card.